« March 24-25, 2012 ~ Tomatoes! Remember the plan you made in Lesson #3: The Plan? It’s time to get that out. This will tell you how many seeds to plant for each kind of vegetable. Before you get to digging, though, you will have to revise the plan just a bit based on the height of each different plant. I like to think of the north side of my garden as the back—that’s where the tallest plants go. If you are standing on the south end of the garden, you want to be able to see every plant in your garden when they are all at their mature sizes. If you can see them all from the south, that means they are all going to get sun. To do this involves a bit (more) planning ahead. * These guys will all climb poles or a trellis, so they will grow as high as the trellis, in most cases. Go ahead and rearrange The Plan so that everyone will have some sun shining on them when they grow up. Before you start digging, be sure you have amended the soil properly—if you haven’t already, see: Lesson #2: Playing in the Dirt. If that’s all done, then you are ready to plant! 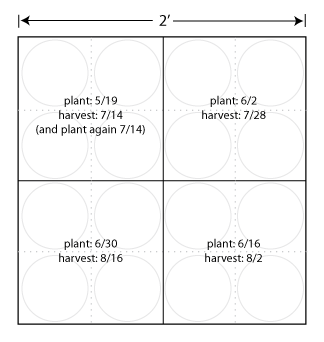 Measure the correct distance for the next seed, and repeat (be sure not to overcrowd your plants—use the distances listed in the Thinning section on the back of the seed packet). Mark your seeds with a plant tag so you know what you planted where. Water—but be sure not to blast your seeds out of the soil with a high-powered hose. Use the shower setting on your hose nozzle, or use a garden wand. 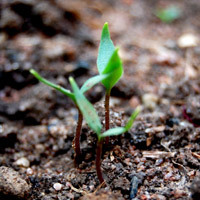 You will be planting seeds at several different times throughout the growing season, and if your previously planted seeds haven’t sprouted yet, you might not know exactly where they are. I like to mark each crop as I plant it. That way, you won’t plant any other seeds there, and you will know where to water each day. This can be as simple as putting four rocks in the corners of each planted patch, use sticks to mark the perimeter, or even get some powdered or spray chalk to make outlines. Just be sure to leave some indication of where you have planted seeds and where you haven’t. Be sure to check your garden every day to see if it needs water. You never want the seeds to dry out, but you also don’t want them completely saturated all the time. Within a few days or a couple of weeks, you will see your little babies popping out of the soil! 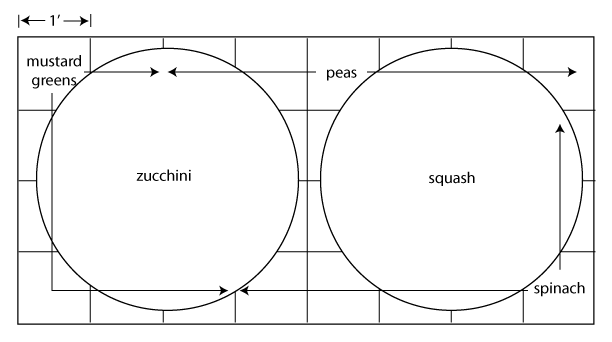 Cool season vegetables and warm season vegetables can share the same plot. Click to see an example plan. For the urban gardener, space is usually at a premium. For this reason, it’s worth using one space to plant two (or more) crops. One method of doing this is to plant cool season vegetables early, then warm season vegetables later. For example: peas are a cool season crop—they don’t like too much heat. They are planted very early in the spring, and are harvested, and the plants are removed before the heat of the summer sets in. But by then, it’s too hot and late to plant many vegetables, so you are left with empty space in your garden. What a waste! Here’s what to do: plant the peas early (next weekend is about the right time). Then after all danger of frost has passed, plant summer squash (a warm season crop) right next to where your peas are already growing. You can plant it pretty close—within a foot. I know it looks like that squash plant is going to, well, squash the poor little pea shoots, but by the time the squash plant reaches its full size, the peas will be long gone. I also like to plant mustard greens and spinach very early in the season, then harvest them before the hottest part of the summer. You definitely want your corn to be the very back of your garden, since it will most likely be the tallest thing in your garden, but don’t plant it in a big row along the back. Corn likes to be planted in big blocks, rather than spread out. The blocks increase pollination, which increases production (more corn!) Also, a big block of plants stands a better chance against high winds than a single tall skinny plant or a row of tall skinny plants. Just 4 square feet of space can provide you with lettuce through the entire summer. Click to see the plan! Fresh lettuce from the garden is fantastic to have on hand all summer for salads. However, it tends to all mature at the same time, which can leave you with too much of a good thing at once. Rather than sowing 20 lettuce seeds all at the same time, plant 4 to 6 seeds, then two weeks later, plant 4 to 6 more. After you harvest your first planting (usually at about 8 weeks for lettuce), you can retill the soil and plant your next round of seeds in the same spot. Continue to do this throughout the growing season to ensure you always have fresh salad greens. Check out the diagram to see how 4 square feet of garden space can yield 2 heads of lettuce per week throughout the entire summer! Other crops that work well for successive planting are radishes, beans, beets, carrots, scallions, and other salad greens. Admittedly, an area I know very little about. The theory is that certain plants should be planted near others because they are mutually beneficial to each other—they provide nutrients, help with pest control, and increase pollination. Check out this post for a good, straightforward overview on the subject: Companion Planting Vegetables for Increased Crop Yield | Eartheasy Blog. A great article on a very important subject. I posted a link to this on my blog. Thanks for posting!!! Here in the northeast the weather has been fairly mild. My lettuce and onions are up.